Many leaders in the developing nations have not been in a position to receive formal training and, of course, lack resources and time to study on their own. Their Biblical understanding is often patchy, as is their knowledge of the background and context. They very often express frustration and a strong desire to learn more. The practical consequence of this situation is that they have a small repertoire of teachings which they tend to repeat over and over again. With such a narrow diet, personal growth is restricted. Churches are vulnerable to wrong ideas carried over from indigenous religions and to extreme and unbalanced teachings from outside. The unhappy situation envisaged by Paul in his farewell address to the elders at Ephesus (Acts 20) is repeated many times over. The challenge was to provide a resource which clearly shows how God's plan for mankind unfolds in scripture, from Genesis to Revelation, in a way which avoids oversimplification on one hand or overloading with detail on the other. There was a clear need for a text which could be read from cover to cover but also act as a work of reference. In terms of language, initially it would be written for those who have completed secondary education and whose grasp of English is good. Patrick Whitworth, an established author with many titles to his credit, who was formerly Rector of All Saints Church in Weston, Bath was asked to write such a book. Patrick was uniquely qualified to undertake this challenge, having had many years of pastoral experience and a strong connection with overseas churches (especially in Africa). Patrick has also read and studied widely. The week before Christmas 2016 saw the launch in Bath of Patrick Whitworth's latest book The Bible: Inside Out. Published by the Trust under its iBtb (International Biblical Teaching Book) imprint, in a single volume of 400 pages, it sets out the Bible narrative from beginning to end. Although there are a number of books giving introductions to the books of the Bible individually, there isn't anything quite like this popularly available. The Bible: Inside Out shows how the 66 books of the Old and New Testaments fit together in God's unfolding purpose and plan. Its theme is particularly important for cultures where the traditional function of religion is to manipulate God (or the gods) into doing what people want, rather than to respond to an invitation to participate in God's purposes. We are very thankful to Patrick for investing his time in this project which we believe will help to cultivate balanced understanding. 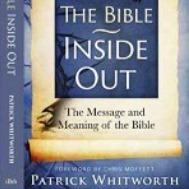 The Bible: Inside Out has been distributed widely to libraries and leaders and has been received enthusiastically by those embarking on Biblical or theological training. We have sent copies out to a number of theological colleges, beginning with two in Tanzania - one copy for each student and each member of the teaching staff. We have also sent out copies to some 500 libraries. The book is now available for sale in the UK and this will generate funds to send more books to the nations. It will also be made available for on-line purchase.